Welcome to my site which is designed to unlock all the secrets of Korean food, and show you how anyone can make Korean cooking part of their life. My site if full of easy to follow Korean Recipe’s with plenty of Korean Food pictures, helping to guide you through the entire process and open up your pallet to a new way of eating. Did you know that Korean cuisine is one of the fastest growing food cuisines in the world? You may have already tried our most popular dishes like Kimchi or Bulgogi, however there is so much variety to to Korean cooking that there is something for everyone. I am adding new recipes all the time and hope to have something you will try and love, please join the free members club to be kept informed of all the latest updates and get exclusive offers direct to your email inbox. I would like you to get involved, try out some of the recipes at home and show me what you have done, or share your experiences of Korean restaurants from around the world. I hope to be able to run some competitions soon and lets all have some fun with South Korean food. Korean food is unique in its flavours, we use our very own red pepper paste called gochujang, and also use soy bean pastes, fish sauces, fruit, soy sauce and sesame oil to create amazing Korean dishes in minutes, and I am sure you will love them as much as my family does. 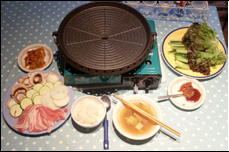 In fact I believe that the uniqueness of Korean Cuisine is what makes it so popular around the world, and if you knew how simple it was to cook you might be eating Korean food every day. On the left you will see that I have a link to all my Korean recipes, this is a great way to learn about Korean cooking, the recipes are simple and easy to follow with Korean Food Pictures. Under the Korean Foods tab you will find some interesting information about some famous foods that will certainly wet your appetite and you should try if you ever visit a Korean restaurant. I have a section for famous side dishes which accompany our food so you can create an authentic Korean meal. These are easy to make and often stored in the fridge for instant use, very much part of our culture and an important part of Korean Cooking. There is far more to Kimchi than most people realize, in its simplest form it’s a spiced fermented cabbage, which is in the top 5 healthiest foods in the world, however there are many different types of Kimchi, because of the many regional variations throughout South Korean Food. I have created some pages on how to make it at home, the health benefits, recipes using kimchi and show you some of the most popular varieties. 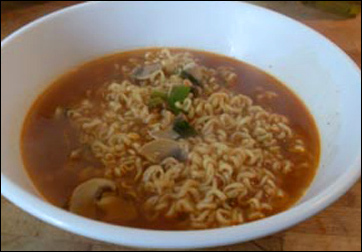 Korean Noodles are very popular throughout the world, and are very quick and easy to make. There are a variety of both instant noodles and ones you can make yourself. I will show you how to get the best from them and some secret ingredients that make them even better. I have also put together a section on the famous Korean Barbecue; this is a common way to eat in a restaurant and great insight in to the Korean Cuisine, You can add and share your own experiences of Korean Restaurants to! I hope you enjoy my site, feel free to comment on my recipes and join in the cooking competitions, and feel free to email me with any questions. What to Learn to Speak Korean? Learn Korean Language is a great English language website that teaches you in simple steps to speak Korean. A great way to learn more about the Korean culture. 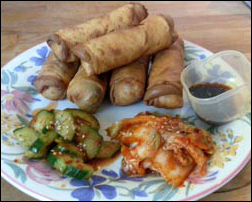 The Easy Korean Food blog keeps you up to date with all the latest recipes and updates added to my web site. Subscribe here. 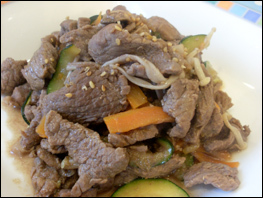 Search Easy Korean Food site and quickly find what you are looking for. The Best Korean Food Recipe collection, Here is my compilation of easy to make Korean Recipe, All these authentic Korean Food Recipes that you can make at home, All recipes have Korean Food Pictures. A Collection of Korean Fish Recipes, Authentic and famous Korean fish dishes for you to try and love. 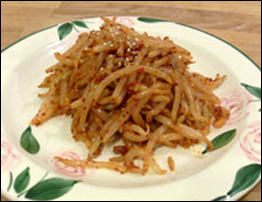 Korean Side dishes known as banchan are unique to South Korea, Korean side dish form part of a meal and compliment the main dishes. Here are a selection of the most famous with easy to make recipes. Kimchi in its basic form is fermented cabbage, My site has the best recipes, Many Kimchi pictures and lots of information about the different types and the history. I will show you how to make really easy Korean Soups, A number or authentic recipes that you can make at home. Korean Noodles are a very tasty alternative to standard noodles, Cooked in minutes with unique flavours, these make the perfect lunch. Korean Restaurants: Submit and read reviews for Korean Restaurants throughout the world. South Korean Drinks have a wide variety of unique flavours, from Soju to Rice wine there is a taste for everyone, There are also a number of drinks which have great health benefits to. Korean Sauces are the base of all Korean food, learn how to use these to make your own korean style food.